As I posted earlier in the week, Safeway is running a 20% off meat sale through Tuesday. Our reader, Joanne, reminded me that clearanced meat will also be discounted by an additional 20% at the register. 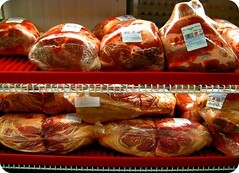 Check out the little clearance section for 30-50% off chicken, turkey, pork & beef that is nearing its expiration date. In my experience, only the poultry and pork expiration dates need to be strictly adhered to–and I always go a day or two later than that, but I’m risk taker. Beef will last for a couple more days. Or you can just throw it in the freezer in meal sized portions.